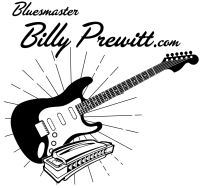 Billy Prewitt is a self taught on guitar, harmonica & bass learning enough to make a living until he met Otis Rush who hired him and taught him the blues. To date Otis has 41 classic blues albums. Billy's credits include a "Streetwise Diploma' from dropping out of school, that gave him the credentials to move forward in Chicago south side blues. In 1962 Billy formed his first group and met Buddy Miles,who was in the local rival group. At 16 Billy joined the United States Air Force and worked with many local groups. That year he met Otis Redding and was encouraged to continue playing blues. After the military Billy moved to Miami, formed a new band and worked with Wayne Cochran (Going Back To Miami) as house band at the local club called "The Barn". Then he moved to New York City and worked local Greenwich Village night spots where he met Paul Butterfield where they lived in the historically artsy Albert Hotel. Paul convinced him to move to Chicago and play the blues. After this chance encounter critics began comparing Billy to Paul in musical reviews because of their similar electric Chicago style approach and aggressive amplified sound. Moving this time to Old Town, Bill began jamming occasionally on stage with Freddy King , Howlin' Wolf., and Otis Span becoming a regular at the historic "Mother Blues" Nightclub on Wells Street. Billy finally landed a permanent job with blues master Otis Rushwhich would last for many years through the 1970's. Bill & Otis traveled together from Chicago to New York and played the very first Ann Arbor Blues Festival of over 10,000 spectators in 1969. Bill became friends with Wayne Bennett, who was the original guitar player on Bobby Bland's early albums and learned lots of licks. Billy had been living nearby 2120 South Michigan for quite some time during the legendary blues recordings at the Chess Recording Studio. On March 23, 1969 Otis and Bill were featured on the cover of the Chicago Sun Times Sunday Magazine with a feature article called "Black, White, and the Blues". Paul Butterfield was the first white musician to bridge the crossover of Chicago blues to the white audience and Billy was close behind following in his footsteps. Later that year Billy attended the original Woodstock and while working with Sam Lay (the original Butterfield Blues Band drummer) decided to produce his own album. The side men included Phil Upchurch on bass and the late Donny Hathaway on keyboards. The late Steve Goodman heard Billy in the studio and asked him to play harmonica on a demo tune he wrote called 'City of New Orleans' that went on to be a big hit for Arlo Guthrie. The next job to come along in Chicago was with "Baby Huey & the Baby Sitters" on Rush Street, a 14 piece black soul band. At this point he couldn't resist forming his own group again. Having always had a sense of humor about his legal name "Horace William Prewitt III" he called his new group "Horace Monster" which would continue working in one form or another for next 15 years from rock & roll to finally a power blues trio. In the Chicago Reader's Annual Poll the band was voted the top rock act of 1975. One of the local performers who auditioned for that band was Chaka Khan who was leaving a band called "Rufus". Horace Monster often became a topic of conversation on the popular Steve Dahl show. Billy moved into his van to economize which became his permanent residence for the next 2 Chicago winters. He met lead singerLowell George of "Little Feat", and Lowell showed interest in recording 4 of Billy's songs just before Lowell died 2 weeks later. Billy went on his own with an acoustic mostly blues solo career for the next 2 years. He was asked to join a new version of "Alliotta, Haynes, and Jeremiah"replacing Skip Haynes who left for a solo career. After Billy left the group Harvey Mandel joined to replace Billy. Later that year he teamed up with singer Mark Skyer for a blues duo. 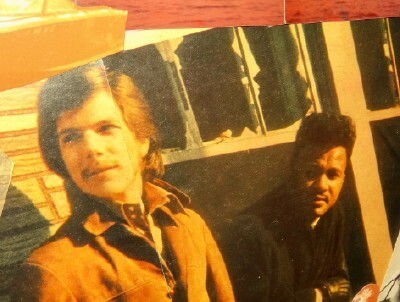 Mark had just returned from touring with "Canned Heat" and Harvey Mandel. In 1979 Billy wrote The Hollywood Sign and it was permantly featured on the official "HollywoodSign.Org" website. Then in 1980, he wrote and recorded "Feels like gold" that got air play on WLUP, WXRT, WLS, and WMET. He also recorded a popular WXRT commercial for 'The Chicago Music Company'. On March 3, 1982 David Letterman mentioned Billy on his national TV show and that summer Billy played a new event in Chicago called "Chicagofest" with Dana Clark. On December 14, 1990, Ben Hollis, star of the "Wild Chicago Show" interviewed Billy for a segment about his music. That same year Bill takes out his well known double neck lightning bolt guitar and forms the "Greased Lightning Band" bringing back 60's & 70's "duwap" music playing summer festivals. In 1996 Billy met the late legendary blues singer Bobby Blue Blandwho encouraged Billy to stay loyal to the blues. In this new age of computers old friend and bluesman Charlie Musslewhite used his Blackberry to communicate by e-mail from his tour bus on the road. They found that Charlie and Bill's dad were born in the same small town in Mississippi called Kosciusko, one of the original southern blues Cajun towns. Hall of Famer Richard Shurman once called Billy "The ghost of Paul Butterfield"
Billy now plays only a few select jobs each year only for blues enthusiasts going back to his blues roots. Always thinking "outside the box" and not afraid to try something new he has become Chicago's first "One Man Jam" using the brand new technology of the Boss RC 300 "looping" station to create a 100% improvised unique blues show. He says he never goes to work, he goes to play! When he is asked to play "The Best Of Billy Prewitt" he says the best is yet to come with no "Sell By" date !